Schofield Watch Company launches two limited edition Signalman model wrist watches. 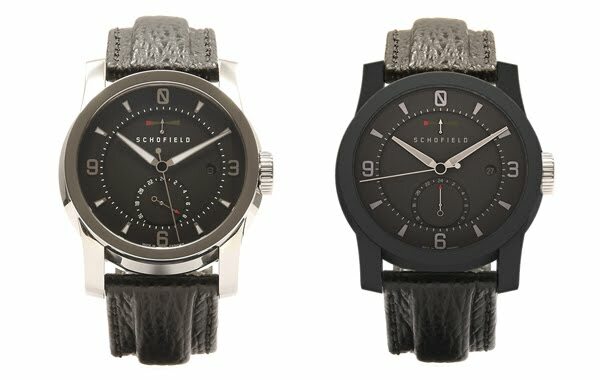 Up-and-coming British watch company, Schofield, has just launched two versions of the Signalman, a watch uniquely styled to suit those who appreciate quality, design and practicality. With an understated Englishness, the Signalman was conceived for the ‘active gent’, a genre of watch built to work with you, to be worn all the time, for all occasions. Schofield uses modern and advanced materials, finishes and engineering techniques to manufacture watches designed to be functional and enduring. The Signalman is made to such a high specification that it is water resistant to 500 metres and incorporates anti-magnetic case components to resist everyday magnetic fields. Powered by the Swiss Soprod 9335, this trusted, automatic, mechanical movement will provide accurate time keeping for generations to come. The Signalman features a GMT display, giving a second timezone that suits international travel, a power reserve indicator showing how long the watch will function without being worn, SuperLuminova C1 filled hands and hour markers allowing superior readability in the dark and an anti-reflective sapphire crystal resistant to scratching, preserving legibility. The mirror polished stainless steel (GMT PR) and matt black Diamond Like Carbon (DLC GMT PR) are limited to 300 and 100 units respectively. Schofield offers you your choice of production number, which will be engraved on the watch case back and box front, subject to availability. Both watches are supplied with exclusive shark skin straps, packaged in hand made cherry wood boxes. Limited edition to 300 pieces or 100 pieces for the DLC model. Automatic Swiss Soprod 9335 movement, 31 Jewels, 28,800 bph (4hz). Decoration: Côtes de Genève, perlage, Rhodium plated, blued screws. Power Reserve: minimum of 42 hours, displayed at 12 o’clock. GMT display at 6 o’clock, set via push button at 4:30 o’clock. Water resistant to 500 metres. 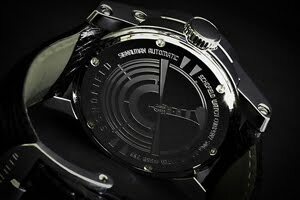 Signalman case: 44mm diameter, mirror polish stainless steel or microbille DLC. Dial: on two levels, applied numerals, Super-Luminova C1. Sapphire crystal: domed, anti-reflective coating on the inside. Strap: special edition, water resistant black shark-skin, lined with green calf. Buckle: curved, polished stainless steel, engraved, screw in.